This should be the hot season. So far it has not been hot at all. This morning started with drizzle and 26 degrees celcius. 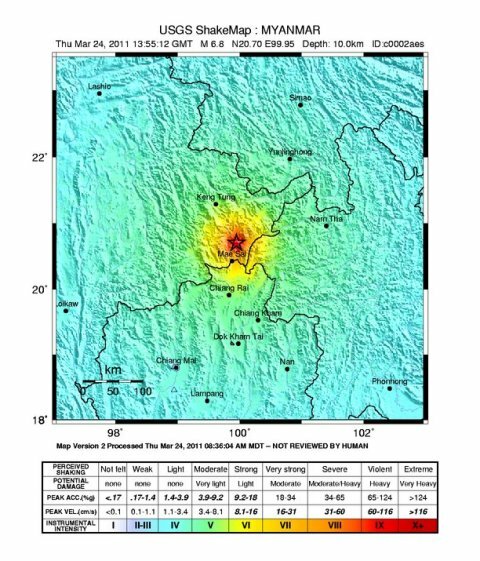 An earthquake with magnitude 6.8 hit Myanmar, just some 89 kilometers away from Chang Rai. It was also clearly felt in Chang Mai with some people leaving hotels at the moment of the quake. Because I used to practice shooting in Belgrade I just searched on google for shooting in Bangkok (keep your filter on moderate search). Today Christina and I went to Central World for some shopping. It's still one of our favorite shopping malls despite all the other fancy malls in Bangkok. It's just big and you can find almost everything you need. What more do you need from a shopping mall. Today I left home at 06.00 in order to catch the morning flight to Phnom Penh in order to attend a meeting at 10.00. Not that special but the temperature this morning was quite special. Only 19.2 degrees celcius when I left home! During the day it even dropped further to 17 degrees in Bangkok. Incredibly low and it didn't happen for 10 years and really not during this time of year. It is supposed to be the hot season. Our friend Addy arrived one week ago on Sunday. Next Thursday he will go back to the Netherlands so we had last weekend to show him a little bit of Thailand. After some discussion we decided to first go to Pattaya on Saturday. Not because it's the best destination in Thailand but it would give him an impression of a part of Thailand which is all that some tourists ever see of this beautiful country. After lunch in central festival festival which is located at the same place as Pattaya Hilton we went for a walk. 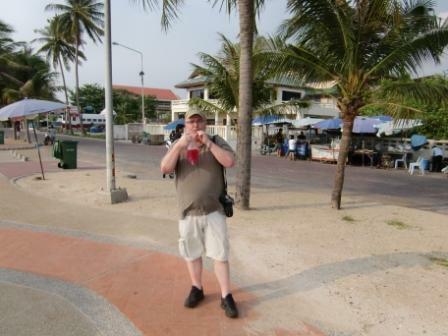 Very soon it became clear to him that that a part of the tourists of Pattaya are only up to one thing. Seeing is believing, I am sure he will write more about it in his travel story. We decided to drive back to Bangkok as close to the coast as possible. Therefore we first drove towards Chonburi. To our surprise we could stay close to the coast for a long time. Our map is for sure not very detailed because most roads did not show up on the map. It turned out to be a very nice trip. We paused at several occasions to admire the view or to search for shells. At one of the stops Addy decided to buy a drink from a local vendor. He came back utterly surprised because he didn't know that sometimes they poor the drink in a sandwich bag with a straw. 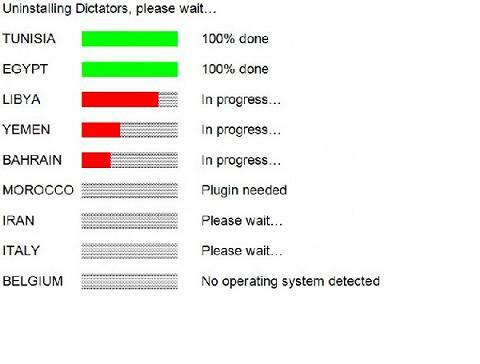 The picture says it all. In Dutch because impossible to explain properly in English. Addy had ook nog een kadootje meegebracht. Een DVD met de oudejaarconference 2010 van Guido Weijers. We hebben dat natuurlijk helemaal gemist terwijl we ons nieuwjaar in het zuiden van Thailand vierden. Dus op 7 maart 2011 hebben we zojuist genoten van onvervalst Nederlands cabaret. Het was leuk maar voor elke cabaretier is het moeilijk voorgaande voorstellingen te overtreffen. Ons schoot tenminste nog onderstaand fragment te binnen, toen lagen we dubbel van het lachen. Bij deze conference was het meer grinniken. Every morning and evening when I am trying to get through traffic in my car I listen to Wave FM 88, a radio channel broadcasting in English in Thailand. Every half hour I get BBC's world news and it's quite ok. Just listen to it via internet if you want to get an idea what many foreign drivers are listening when they are stuck in traffic. Besides from the music the Thai commercials sound funny too. Another typical Thai thing, every day at 18.00 sharply they broadcast the National Anthem. 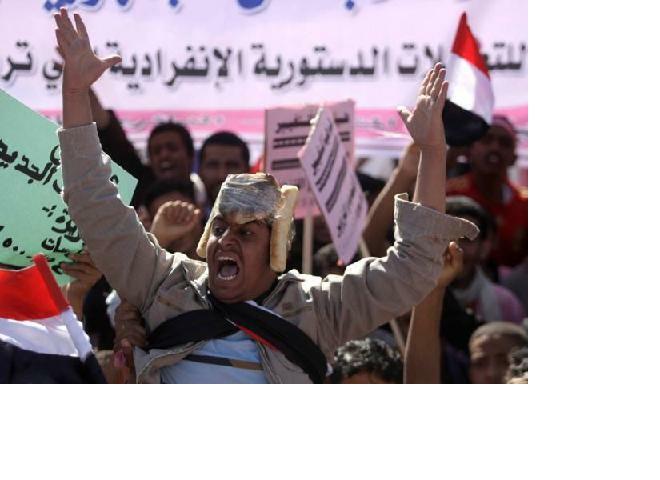 This week I received some very funny pictures in my email. Thanks for sending them. 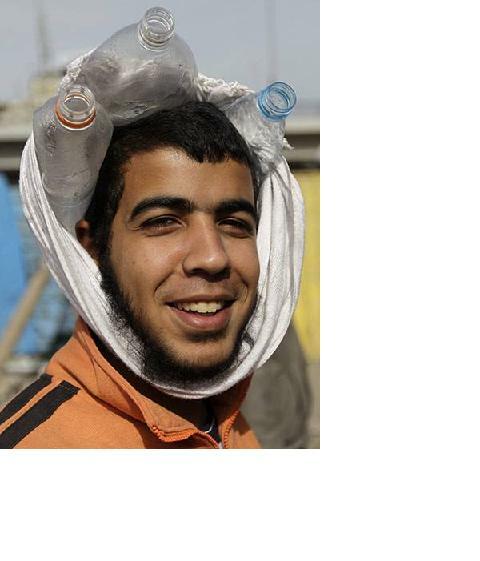 What do you think about this bloke, the latest Egypt riot helmet protection, retro style from the 70's. The famous 3 bottle model.